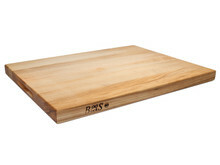 #1: Always popular, the John Boos R02 reversible maple cutting board. Extra large with 24" x 18" surface. 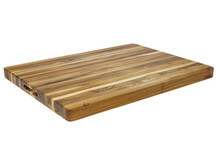 #2: Awarded "Best Cutting Board" by America's test kitchen, the Proteak Model 107 teak cutting board. #3: Beautiful acacia wood, with the look of walnut but only 1/3rd the price. 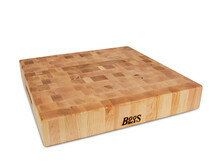 #4: John Boos end grain butcher block with American maple. #5: For the knife afficionado, hinoki is regarded as the best wood to use for cutting. Exclusively imported by CuttingBoard.com. 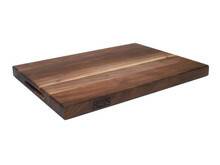 #6: Exquisite American Black Walnut made by John Boos, the most famous name in cutting boards and butcher blocks. #7: Premium 2-1/4" thick American Maple with side handles. Also by John Boos. #8: Our exclusive all-in-one cutting board maintenance kit, with mineral oil, wood wax and applicator cloth. 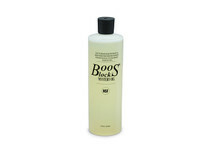 #9: John Boos Mystery Oil, made for butcher blocks, countertops and cutting boards. 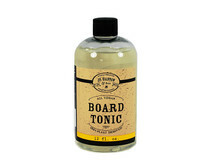 #10: Bartow Board Tonic, a plant based wood oil that is food safe, non-toxic and vegan friendly. Great for salad bowls and utensils. A chef has many tools, but one stands out above the rest: a knife. Correct that, a sharp knife. A properly honed blade makes prep work easier, results in cleaner cuts and is actually much safer to use. Contrary to popular belief, a dull knife is actually dangerous to use, because it requires much more force to get the same job done as a sharp knife. Keeping a knife sharp is thus of utmost importance, which is why we often are asked which cutting board is best for knives. The first thing to understand is how knives actually become dull. The two main reasons a knife becomes dull is either a rolled edge or an edge that has become rounded. To understand both, you need to consider that while the knife edge may look uniform to the naked eye, the actual edge is quite thin and jagged at the microscopic level. A rolled edge is when the edge becomes bent or rolled over to one side and is caused by physical pressure to the edge of the blade. If you can imagine pressing a fork into a brick, the bending of the fork is exactly what happens to the edge of the knife on the microscopic level. This is most common reason that knives become dull, which is why nearly all knife sets include a honing steel (often referred to as a “sharpening steel” although technically incorrect). The honing steel works by physically forcing your knife edge back into place, as opposed to grinding away bits of your knife with a true sharper. A rounded edge is when actual material is removed from the blade due to friction, tearing or abrasion. In English, this is normal wear and tear on your knife from slicing food, chopping against your cutting board or even from corrosive effects due to the acids in your foods (tomatoes are notorious for this). When your knife edge becomes rounded, this is when your knife requires actual sharpening by grinding down the edge. Now that you understand these two methods of dulling, let’s talk about how the cutting board material factors in. If you have a board made from a hard material, it will cause your knife edge to roll because there is less give. If you have a board that resists scoring, that will cause your edge to round because it creates greater abrasion on the knife. In most cases, these two factors go hand in hand, but there are a few exceptions because density doesn’t always equate to cut resistance. Since we are talking about the interaction of two materials, we also need to address the hardness of the knife. The top selling knives are made with stainless steel, which has varying Rockwell hardness ratings from 55 to 59. Specialty knives, such as carbon steel knives or Japanese VG steels, are harder with Rockwell ratings 60+, but have the drawback of being more brittle and prone to chipping. As a few definitions, we refer to a knife material as "Rigid" if it is made of a steel that generally doesn't bend (Rockwell 60+) or is a ceramic blade. A "Good" rating for Knife Chipping means that there is a low chance of chipping. To start with an easy villain, one of the worst boards for your knives is glass (or any stone). Glass cutting boards are very hard (almost as hard as steel) and will not score, which is why these boards are notorious for dulling even the best of knives. On the other hand, plastic HDPE and softwood cutting boards are given good scores on maintenance and chip risk, which are great for your knives, but come at the expense of the durability of your cutting board. Composite fiber cutting boards are often seen in commercial kitchens and are made from layered phenolic resins, often called Bakelite or Richlite. Though these composite boards claim that they are “knife friendly”, this material is incredibly strong and does not score easily – which is why we gave it poor or fair scores for knife usage. The conclusion to draw from this chart is that you can either have a low maintenance cutting board or a low maintenance knife, but not both. If you’re a gambler, you could try using that $300 Shun VG-MAX on a composite board and possibly have the best of both worlds, but you’re also playing with fire and hoping you don’t chip your edge. *Note that we listed a softwood cutting board as having poor board life with a rigid knife, although we are not factoring in knife skills or the type of knife. If you are a sushi chef with a straight Shun knife vs a home cook chopping away with a $10 ceramic knife, your mileage will vary of course. We will say that the one contender that is potentially low maintenance for knives and long lasting are plastic HDPE boards. These are most often used in commercial kitchens as well and have the benefit of being able to toss in a dish washer. The drawback is that they are not the prettiest boards and are more prone to harboring bacteria than wood cutting boards. Since wood cutting boards are our most popular item, the question that we know is coming is “Which woods are considered a hardwood and which are considered a softwood?” While there is a technical definition, what we’ve done is listed the most common cutting board woods based on the Janka scale. This rating is used to rate the durability and hardness of wood, based on the pounds of pressure required to dent the wood with a metal ball. A high Janka rating generally means that the wood will be more resistant to scoring, though a woodworker will tell you this is not always the case due to the grain and wood fibers. Some woods, such as cherry wood for example, are lower on the Janka scale, but can be difficult at times to work with. In regards to knives, a wood grain that is straight will often be better for your knives because there will be more consistent pressure along the edge of the blade when slicing and especially with chopping. A prime culprit are some types of bamboo boards which have a straight consistent grain, but also have intermittent nodes. These nodes are incredibly dense compared to the rest of the grain, which is the metaphorical equivalent of exposing your knife to a pillow fight... except some pillows have books inside of them. It's a bad surprise. Of the woods listed, larch wood and hinoki are considered softwoods while the rest are considered hardwoods. There are, of course, many other common softwoods such as fir and pine, but these are not commonly used to make cutting boards, due to their porous nature. You can read more about this on our article Why some woods are better than others in the kitchen. Brazillian Walnut (Ipe) and Brazillian Cherry are not commonly used for cutting boards either, but we listed them to show the upper bound of Janka ratings, as Ipe is one of the hardest woods available. An interesting thing to note is that maple and bamboo are almost identical in their Janka rating and these are both the most commonly used material for natural cutting boards. Given that most consumers are more interested in the longevity of their cutting board than the sharpness of their knife, this gives a good indicator of what material density is holding up in the kitchen. However, if you do have quality knives, our opinion is that it makes much more sense to pick a softer wood, such as teak or walnut, which is at the lower end of the density range. Walnut is known to have a high workability (and thus, easy to score) and teak has an abundance of side benefits, not the least of which is superior maintenance. 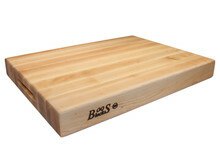 So which cutting board are best for your knives? The answer is that there is no definitive "best" board out there, because it depends on your willingness to compromise between a sharp edge and a cutting surface that scores. 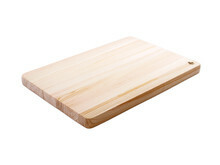 Plus, unless you are a commercial chef, looks almost always plays a part in which cutting board people purchase. If you are a knife aficionado, it would make sense to invest in a softwood cutting board or even just go with a basic plastic board. If you're looking for a middle ground, any hardwood board (except the very dense boards) will likely do just fine. Most importantly, utilizing proper knife care and knowing how or where to sharpen your knives will always be the main factor in keeping a sharp edge. As always, from us at CuttingBoard.com, chop responsibly!